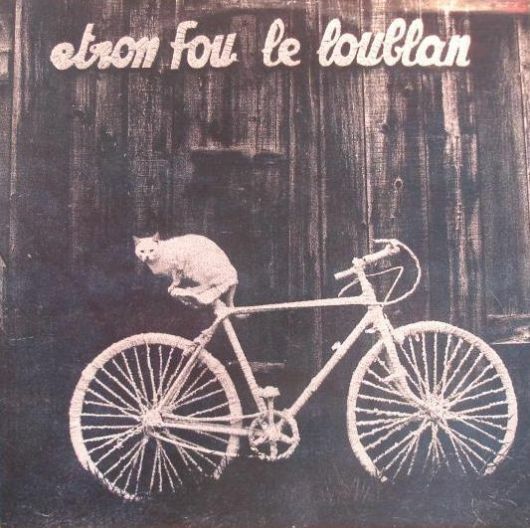 Etron Fou Leloublan were the most eccentric of the decidedly odd bands in the original RIO movement. For some years they functioned as a trio with rhythm section Ferdinand Richard (bass, guitar, voice) and Guigou Chenevier (drums, sax, voice) and a rotating cast of saxophonists/lead vocalists. In their early years the frontman was Chris 'Eulalie Ruynaut' Chanet, a talented comedian as well as a musician. This was the line up that started their career opening for Magma and recorded Batelages, their debut album, generally considered to be their least accessible. It opens innocuously enough, Ferdinand Richard playing some fairly tasteful fingerpicked guitar while Guigou strokes the cymbals - then the drums strike up a Beefheart style beat, Richard strums a frantic proto punk rhythm and Eulalie starts declaiming the lengthy narrative that winds its way through the opening 18 minute epic L'Amulette et le Petit Rabin. After about 5 minutes Richard switches to bass, Chanet starts blowing some very free tenor sax and the ensuing instrumental passage sounds like it was recorded with the three musicians were in seperate rooms, quite possibly on seperate continents. In fact, it all works rather well - Richard and Chenevier formed an unorthodox but highly skilled rhythm section which doubtless inspired Ruins, with Chanet's freeform voice and sax meandering over the top of it all. The piece switches between vocal and instrumental interludes and will either enchant or infuriate. The second half of the album is more instrumental but equally bizarre - it starts with a drums/percussion piece, followed by 22 seconds of Yvett' Blouse. Madame Richard/Larika opened side 2 of the vinyl original and is a lengthy piece which is probably the most recognisably RIO style piece on the album, with the sax played through effects pedals at some points. Histoire de Graine closes the proceedings, with vocals by Richard and very much in the style of the opening track. Batealges is a very raw piece of work, but the talent of the three performers is obvious and there are some excellent passages of free jazz/rock lunacy if you're prepared to persevere with it. Captain Beefheart is the most obvious reference point, although if you can imagine Henry Cow getting very drunk and jamming with a stand up comedian that will also give you some idea of what to expect. Understanding French isn't necessary, and may even be an advantage as the vocals become just another instrument. Following this album Chanet left, later to join Urban Sax, and EFL would acquire a new frontman for the next stage in their career. As uneven as it is there's plenty of inspiration in evidence, and lovers of the truly surreal and bizarre will enjoy it. If you're not already a fan either of the band or RIO in general, start with one of their later albums; otherwise jump right in, but don't say that you weren't warned!